"Summertime.... and the livin' is easy. Fish are jumping, and the cotton is high...."
Growing up, this was one of my dad's favourite tunes to strum (and sing along to) on the guitar. My dad likes to sing pretty loudly, probably harking from his days as lead singer in the band "Skonkie, Tommy & Ek" ("Ek" means "I" in Afrikaans). At least that was the title scribbled in pencil on the tape* that him and his two friends recorded one summer. Summertime featured twice on this tape (side A & side B) and was clearly a firm favourite of the wannabe musicians. Perhaps the temperatures were as high as their aspirations when they recorded it? Either way, my memories of the song came to fore again over the sweltering past few days. I could almost hear my dad's voice murmuring the lyrics as he tuned in his guitar... Only, instead of fish jumping, we had baby kittens galloping and instead of cotton standing tall, we had herbs withering in the heat. Not quite what Mr Gershwin envisioned in his hit song. So we did what all sane people would do - made bucketloads of iced tea, mixed tall glasses of ice-cube stuffed cocktails, lit the fire and invited some good friends around to complain about enjoy the heat with us. And we made salads. Big bowls of fresh greens and juicy carrots, sour Granny Smiths and refreshing cucumber, partnered with chunks of feta cheese and handfuls of herbs. Whatever vegetables we had in the fridge were utilised in this manner and finished off with a swirl of homemade salad dressing. But I had a special plan for the candy-striped beetroot. From the outside, these baby bulbs looked almost exactly like radishes - in fact, I actually thought they *were* radishes, having completely forgotten that I'd ordered beetroot. I had grand plans for those radishes. They were going to be sliced into paper thin slivers, gently tossed with cubes of avocado and sprinkled with sesame seeds. I would whip up some sort of salad dressing and add handfuls of mint from my own herb garden. Well. 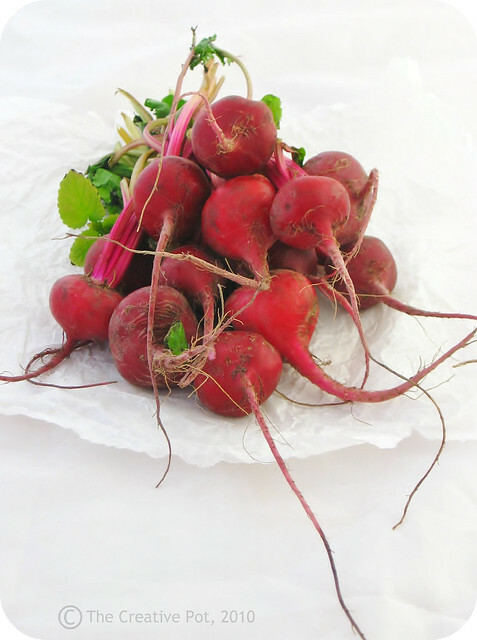 The "radishes" turned out to be the candy-striped beetroot that a small part of the twitterverse had dreamed up grandiose plans for the previous week. As I sliced the tops off, the perfectly concentric circles of pink and white were revealed. A smile spread quickly across my face. They were the most beautiful things I'd ever seen! Vegetable-wise at least. Eagerly, I sliced open the rest - all pink and white and stripey. I wanted to preserve their dazzling good looks and so I sliced them thinly and tossed them with olive oil, lemon juice, salt and pepper, intending to use them raw. But good looks does not necessarily equal exquisite taste, as TheHusband and I soon discovered. Raw beetroot, while super pretty, was going to be a hard sell. So I popped 'em under the grill for a few minutes to bring out their natural sugars, then combined them with the rest of the ingredients. Superstars they were, even if their looks had faded ever so slightly (like many an overly-botoxed Hollywood lady). But looks aren't everything, right? *The tape was legendary, featuring a younger, almost rockstar-ish version of the man we know simply as Dad & providing myself and my brother with many, many hours of mirth. This was in the early years of tapes and tape recorders and one of my favourite parts of the tape is the external noises captured along with the songs, providing a bit of a slice of life from the early 70s. And of course the part where they don't realise the tape recorder is on and one of the guys swear at something not working was my teenaged self's favourite favourite part. 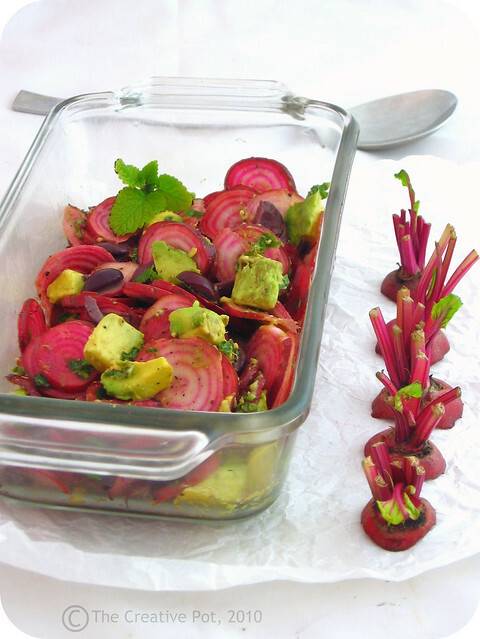 Pretty candy striped beetroot takes centre stage in this simple salad of grilled beetroot slices, avocado and black olives. A refreshing change from the usual vinegar-y beetroot salad from my youth. 1. Toss beetroot slices with olive oil, lemon, salt and pepper, then spread out onto a baking tray and place under the grill for 10 - 15 minutes. Watch them closely, they tend to crisp up when left too long (which isn't necessarily bad, just not quite what you need for this salad). 2. Remove beetroot from the oven, allow to cool slightly, then gently combine with avocado, olives and chopped herbs. Adjust seasoning and squirt over some more lemon juice if required. Serve immediately, before the avocado discolours. NO beetroot to be found anywhere on my island, nevermind these beautiful candy striped ones. Awesome photos! I can definitely get down with that version of the song as well! Thinking of fish on the grill... Hmmmm. This salad is really and truly mind-bogglingly gorgeous. You give candy stripers a whole new (wholesome) reputation with this. Talk about a stunning salad. It looks absolutely gorgeous. Can only imagine how delicious it is. Wonderful post and pretty pictures!! How are you? Looks gorgeous! I love these beets, and the greens are really good too (I made spanakopita with them this summer). A note though, about eating them raw - I tried this too in an attempt to keep the vibrant color, but I ate a little slice and was soon dealing with a harsh burning feeling in the back of my throat. I've read that this is fairly common with raw beets, especially this chioggia variety! Thanks for popping in - and thanks for the great tips! What a beautiful presentation for your salad! And a great combination of ingredients: love the avocado cubes! I am definitely a fan of beetroots, and love them raw, too, providing they are finely sliced and have marinated for some time in the dressing! I love beetroot and this seems so much more interesting (and tasty!) than the tinned/bottled stuff in the shops. Mmmm...and I wouldn't mind a pair of earrings or some buttons with those perfectly-pink patterns! Ah, so that's the secret! Making a mental note for next time. 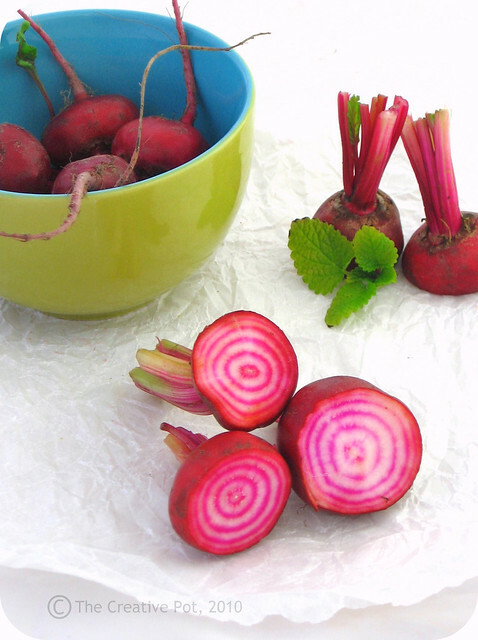 Oh I do love thos stripes... Not a big beetroot fan but I would eat these for aesthetic purposes alone! Lovely shots too. They do look like radishes, but what a lovely surprise. And your combination looks beautiful. Oh mint and beetroots are perfect together. I tried the combination once and felt in love, completely. Dis pragtig! En 'n goeie kombinasie. Hierdie resep word sumier gebookmark.